Shootout: Blackmagic Pocket Cinema Camera 4K vs. Panasonic GH5? HomeFilmmakingShootout: Blackmagic Pocket Cinema Camera 4K vs. Panasonic GH5? 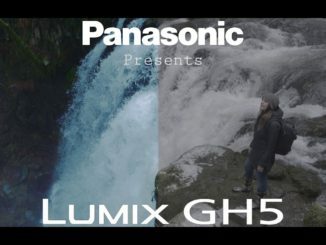 In a micro four thirds cage match, there was a recent side by side comparison of the Panasonic GH5 and the Blackmagic Pocket Cinema Camera 4K. With both camera platforms using the same micro four thirds sensor from Sony, it should be an interesting comparison. Shooting test footage side by side, The Slanted Lens looked at dynamic range, color science, ease of use, and ergonomics. Skin Tones. 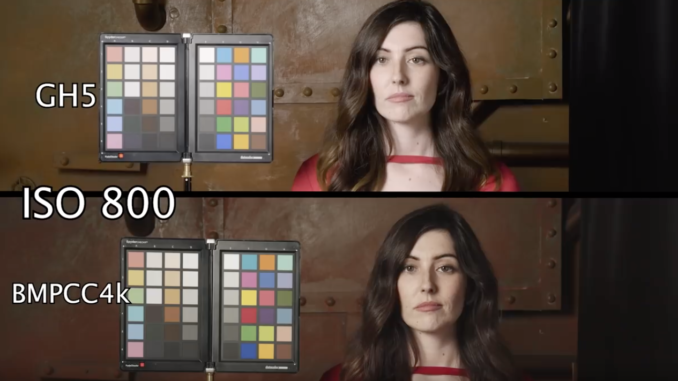 The first main comparison was how well both cameras handled skin tones with their respective color science. 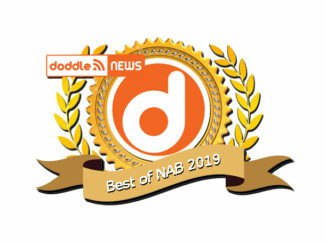 The GH5 was shot in Panasonic V-Log, while the Blackmagic Pocket Cinema Camera 4K was presumably shot in Cinema DNG, since the 12 bit Blackmagic Raw is currently in Beta and they made no mention they were trying it out as well. 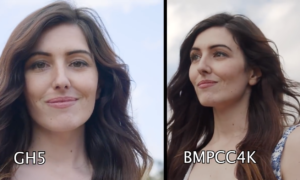 Results indicated that the GH5 skin tones were a tad washed out and muddy, while the color of the Blackmagic was more natural and vibrant, especially when moving from shadow to highlight. Slow Motion. Testing at both 60 fps in 4K and 120 fps in 1080p, the Blackmagic pulls out again with a more accurate color depiction, while the GH5 got a bit more magenta. There was also a bit of artifacting with the GH5, while the Pocket 4K was far smoother in slow motion. Movement. But with shooting hand held, the GH5 has the advantage of five axis image stabilization, while the Pocket 4K has none. That means that it’ll be much easier to use warp stabilizer to steady the image of the GH5, while the Pocket 4K will need some sort of gimbal to keep its image smooth. But with a gimbal, the Pocket 4K really is in its element. Dynamic Range. Dealing with harsh backlit conditions, the both cameras had to deal with artifacting and blown out highlights, especially as it goes from -1 to -3 stops, but the Pocket 4K keeps the color and contrast as it moves even to -2 stops. 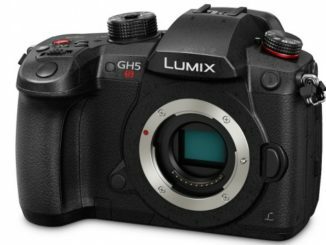 But going the other way, the dual ISO of the Pocket 4K begins to assert itself and is completely dominant, while the GH5 begins to fall apart, even at +1 stop. ISO Comparisons. Here’s another case where the Pocket 4K looks to have the advantage. As the ISO goes up, the colors begin to wash out on the GH5, while the BMPCC4K keeps the colors bold and vibrant. 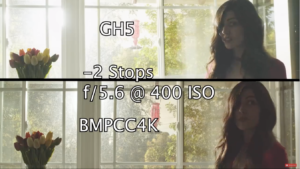 But going to 1600, there’s very little difference, and so the GH5 begins to have some of the advantage. And when you get to ISO 3200, the colors of the GH5 look cleaner and the blacks are less noisy. At ISO 6400, both are struggling with artifacting, but the BMPCC4K enjoys less pixelization, but a slightly washed out look. So it’s the choices that the camera makes to maintain a usable image. Low Light. The slanted lens shoot a darkened, foggy scene with the model holding a lantern. The result was that both performed similarly with usable images and skin tones. It really comes down to the editor preference. Additionally, The Slanted Lens found that the BMPCC4k suffered from poor battery life, and without a battery charger, the camera has to go down to plug in and charge. But being that it uses a Canon battery, it’s a relatively simple affair to pick up a third party charger and simply swap them out. The GH5 also had the advantage of an electronic viewfinder and a pull out tilt screen LCD. So really, it comes down to how you’re going to use it. If you have the camera locked down, the BMPCC4K can really blow the GH5 out of the water, even though the GH5 has a similar sensor. But when running and gunning, unless you add a gimbal, the GH5 is going to have the advantage.